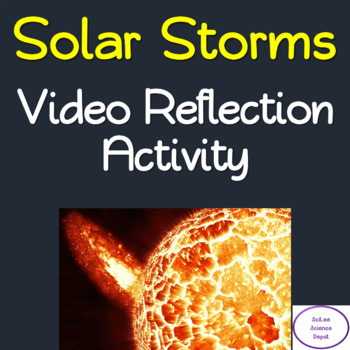 The STEM: Cosmic Journeys- Solar Superstorms Video Reflection Activity is an alternative way for students to actively watch a science video without having to spend time trying to answer specific questions. 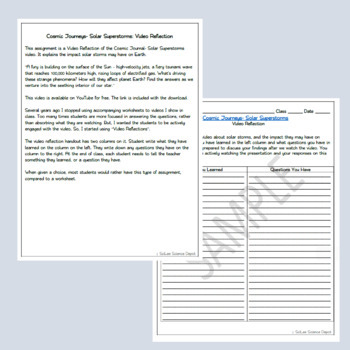 Several years ago I stopped using accompanying worksheets to videos I show in class. Too many times students are more focused in answering the questions, rather than absorbing what they are watching. 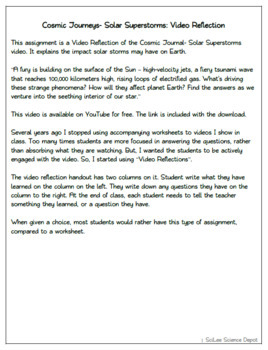 But, I wanted the students to be actively engaged with the video. So, I started using “Video Reflections”. When given a choice, most students would rather have this type of assignment, compared to a worksheet.